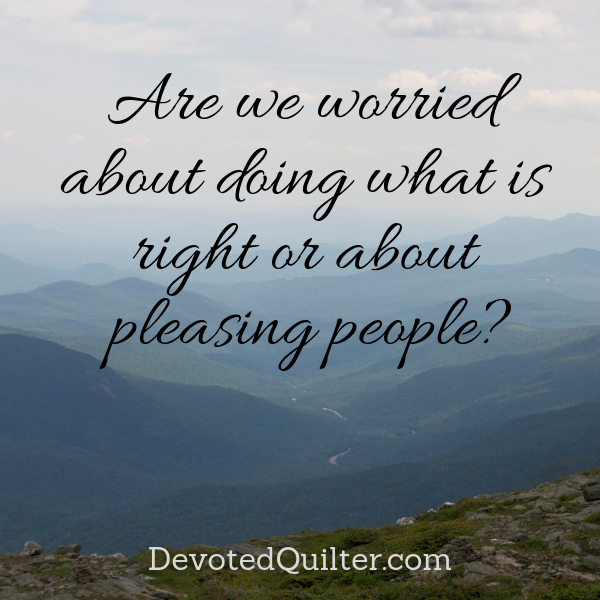 Devoted Quilter: Pilate or Peter? With Easter coming up, I've been thinking a lot about the story of Jesus' last days on this earth. One of the people in the story that I've been thinking about is Pilate. Pontius Pilate's trial of Jesus is told in all four gospels (see Matthew, Mark, Luke and John) and he has always interested me. Pilate was the Roman governor, which meant the Jewish high priests needed him to put Jesus to death because they didn't have that authority themselves. It's hard to tell how long Pilate actually spoke with Jesus since the Bible often skims over most details, but we do know that after talking with Him, Pilate declared, "He is not guilty of any crime" (John 18:38). That should have been the end of it, don't you think? Jesus is not guilty of any crime, so He should be released. Obviously, that's not what happened and it's why that doesn't happen that Pilate has always interested me. After saying Jesus wasn't guilty of any crime, Pilate asked the crowd if they would like him to release Jesus. I love the aside Mark includes in his gospel, where he wrote, "(For he realized by now that the leading priests had arrested Jesus out of envy.)" (Mark 15:10). Pilate understood the situation; he saw the envy written all over the faces of the priests who sought Jesus' death and so he appealed to the people. He clearly wanted to free Jesus. When the priests incited the crowd to demand Jesus be crucified, Pilate asked, "Why? What crime has he committed? I have found no reason to sentence him to death. So I will have him flogged, and then I will release him" (Luke 23: 22). Let's just pause here for a minute. Pilate believed Jesus has done nothing wrong, but he was still willing to have Jesus flogged to appease the crowd. I remember the first time I read that passage to the boys and they yelled out, "What?? Why would he have Jesus whipped? That doesn't make any sense!" They were right. It doesn't make any sense. Unless, of course, you are Pilate and you have an angry, shouting, mob on your hands and you're trying to appease them. The people continued demanding that Jesus be crucified and a criminal named Barabbas be released, to satisfy the custom at the time of releasing one prisoner at the Passover. Mark says, "So to pacify the crowd, Pilate released Barabbas to them. He ordered Jesus flogged with a lead-tipped whip, then turned him over to the Roman soldiers to be crucified" (Mark 15:15). Four words sum up Pilate's part in Scripture, to pacify the crowd. Even though Pilate knew Jesus was innocent and even though he understood the reason the priests brought Jesus to him, Pilate caved to the demands of the crowd because he didn't want to deal with the mob being angry at him. To be fair, having the mob, and particularly the priests, angry at him would have been a big problem for Pilate. He would likely have had to deal with rioting and maybe even with the priests making good on their threat to declare him "no 'friend of Caesar'" (John 19:12), which would have been a huge political problem that he clearly did not want to risk. Regardless of what the consequences might have been, it all boils down to one fact - Pilate ordered Jesus be crucified to please the people. Thinking about Pilate and his need to please the people made me think about Peter and the apostles when they were arrested by the Jewish high council for teaching about Jesus. "They brought the apostles before the high council, where the high priest confronted them.“We gave you strict orders never again to teach in this man’s name!" (Acts 5:27, 28). How did Peter and the apostles respond? "We must obey God rather than any human authority." (v. 29). What a contrast to Pilate! I've never dealt with any situation that had me responsible for a man's life or potentially finding myself thrown in prison, but I have had times where pleasing the people around me wasn't the right thing to do. You've probably been in those situations, too. It's hard to go against people, isn't it? The louder they are or the worse the potential consequences to us, the harder it is to go against them, even when we know that going against them is the right thing to do. How we respond will be determined by one question - are we more worried about doing what is right or about pleasing the people around us? Here's something for us to think about the next time we're in one of those situations: What we do in those moments puts us in either Pilate's or Peter's company. Whose company would we rather be in?